Build compassionate classroom environments and mindful schools that prioritize high levels of achievement and high levels of well-being. 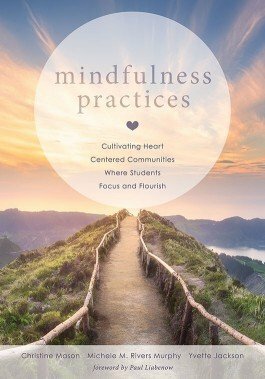 Based on the latest neuroscience research, Mindfulness Practices details how mindfulness in schools can lead to new, improved ways of educating, learning, and living. The book’s mindful education exercises are easily adaptable across grade levels—from prekindergarten through high school—as well as across urban, suburban, and rural school settings. Explore the theory behind mindful education, including the interrelated nature of physiology, cognition, emotions, and mindfulness for students. Learn how mindfulness in schools contributes to a positive mindset, alleviates the impact of toxic stress, and takes advantage of neuroplasticity. Understand the effects of trauma and ACEs (adverse childhood experiences) on student behavior and the ability to learn, and discover trauma-informed practices that support healing. Acquire research-based mindfulness practices, including breathing exercises, yoga for the classroom, meditation for students, and cognitive reflection and awareness. Reignite the passion that first drew you to education and prioritize self-care for yourself and your students. Discover how to build a heart-centered learning community in classrooms and create mindful schools. A book for educators, this book also speaks to anyone who cares about our children and our future. The authors discuss revamping our social system to better meet the needs of low income as well as racially marginalized students. Consider all the prejudices that STILL exist in our society. In order to rebuild our country so that kids are listened to and have hope, educators need more training, to help them understand perhaps what they may never have been taught. Compassion and understanding seem to clear the slates to greater acceptance and inclusion, pride and hope in our society. America can do far better than we are doing. This book teaches about compassion, and lifelong coping skills that actually only take 3-4 minutes a day. Learning is so much more than facts and history and equations. Learning must reach into understanding thoughts, feelings not only ours, but also others. Feeling acceptance and giving acceptance lead to team work instead of barriers. To rebuild America, to instill values of compassion and caring, will take decades. We need to START with our children and with support of their parents. With mindful practices, children will open up and be better positioned to learn. This process NEEDS to start somewhere. The sooner the better for all of us.